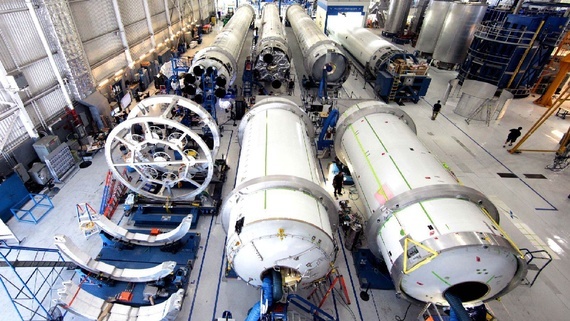 What It Took for SpaceX to Become a Serious Space Company #manufacturingmonday « Adafruit Industries – Makers, hackers, artists, designers and engineers! Last month, NASA said it would pay SpaceX its largest single contract ever, $2.6 billion, to shuttle U.S. astronauts up to the International Space Station (ISS). It’s one of two companies that will build vehicles to replace the discontinued space shuttle and return the U.S. to the list of spacefaring nations. The other, SpaceX’s frequently testy competitor Boeing, will do the same job but at more than half again the cost—some $4.2 billion. In fact, SpaceX has a chance at beating the aerospace giant to be the first private company to fly humans onto orbit. This is an enormous milestone for the firm, and also its most dangerous task so far. But building cost-effective space vehicles gives SpaceX a chance to save U.S. space efforts from their own torpor.